"A pie recipe my whole family loves and begs my mother to make when we have a get together. Wonderful warmed and with a side of vanilla ice cream! I dedicate this recipe to Grace M. Novak." Beat 1 1/4 cups sugar, sour cream, eggs and 2 tablespoons flour in a large mixing bowl until smooth. Stir in vanilla and salt. Fold in rhubarb. 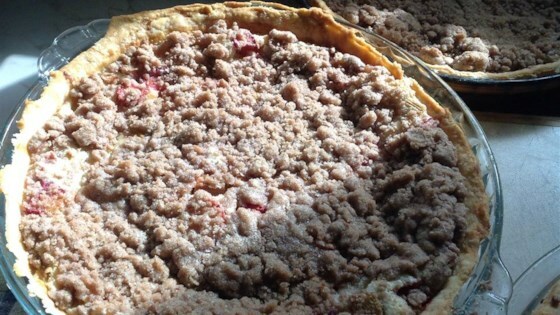 Pour rhubarb mixture into pie shell. Bake for 30 minutes in the preheated oven. Meanwhile, combine 1/3 cup sugar, 1/3 cup flour, and cinnamon in a small bowl. Cut in butter with fork or pastry blender until mixture resembles coarse crumbs. Set aside. Remove pie from oven. Reduce oven temperature to 350 degrees F (175 degrees C). Sprinkle topping mixture evenly over pie. Return pie to oven and bake until filling is set and crust and topping are golden brown, about 30 minutes. This pie was beautiful out of the oven and tasted great. Next time I'm going to increase the rhubarb to 4 cups - I think it would be even better. I've been making Rhubarb Custard Pie with meringue for years. I thought that was the best rhubarb recipe, but this Sour Cream Pie beats it. I loved the soft, non-watery texture inside the pie. I wouldn't change anything except maybe add an extra stalk of rhubarb. Excellent pie! I used egg beaters for the eggs and it turned out great. Only 9 points on WW with the egg beaters. 4.5 if you only eat a half piece! This is my favorite pie. When I don't have enough rhubarb I add strawberries to make up the difference. We made this for the first time last night and it was excellent! We also served it to some friends and they loved it as well. I have never cooked with rhubarb before but it is yummy!